Man, the Scion FR-S has been getting a ton of love lately as we reflect on the best cars of 2012. And for good reason, too — it's awesome to drive. Haven't driven one yet? Don't have the means to buy one at the moment? Don't have a cool and understanding friend who's willing to let you slide it into a guardrail? Have no fear, you can make a tiny little FR-S out of paper and then put it on your desk to make all your stupid coworkers jealous. 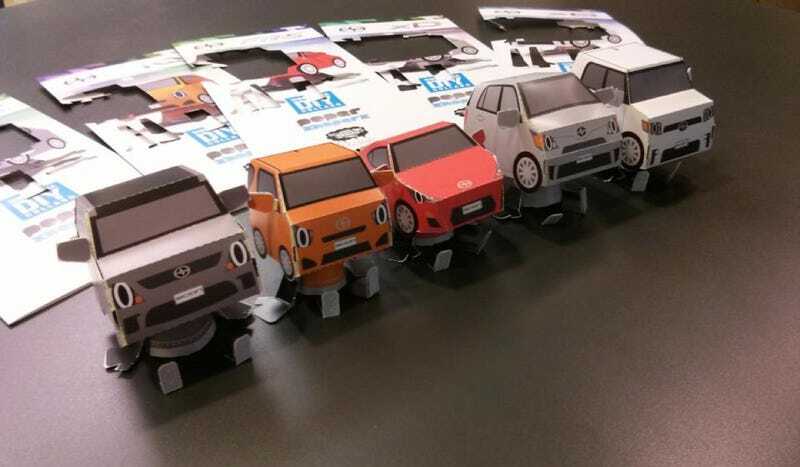 Scion just launched an iPad-exclusive app with the help of designer Shin Tanaka that lets you create a customized Scion that you can print out and fold into a little 3D model. Click here to get the app. You can also print out tiny versions of the less-cool Scions, like the iQ and the xB, but why would you want to?